The men’s and women’s cross country teams finished second and third respectively at the California Collegiate Athletic Association Championships in Turlock, California, over the weekend. The men’s team finished in second place, with senior Ruben Dominguez finishing in third place overall. Dominguez finished the 8,000-meter race with a time of 24 minutes, 30.8 seconds. Chico State seniors Kyle Medina and Connor Fisher finished first and second respectively. Medina won with a time of 24:16.3. Dominguez thanked his teammate and close friend senior Christian Rodriguez for pushing him to be the best he can be, not just this race, but throughout the season. Rodriguez represented the second Bronco in the top-10, finishing ninth overall with a time of 24:44.8. Finishing in the top-25 for the men was junior Oscar Soto in 16th place, senior Grant Stromberg in 21st, junior Devon Reed in 22nd and freshman Jeremiah Suzara in 24th. The women came in third place overall. Senior Lorraine Fernandez led the Broncos in the 6,000-meter race finishing third overall with a time of 21:09.7, just three seconds behind second place finisher, Natalie Rodriguez, a senior from Cal State San Marcos. Other top performers on the women’s team included senior Casey Monoszlay who finished in 13th with a time of 21:41.8 and freshman Samantha Barajas who placed 24th overall with a time of 22:03.9. Fernandez and Monoszlay earned All-CCAA honors. Fernandez is now looking forward to the NCAA Division II West Regional Championships. Preparation and staying focused are a key part of every runner’s game plan. 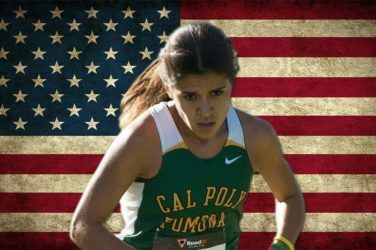 For Fernandez, her performance at the CCAA Cross Country Championships was an indication of just how hard she works and how dedicated she is to prepare for each race. Fernandez believes the Broncos have reached their potential, yet they can still accomplish the difficult task of securing a top five finish at the West Regional Championships. It’s been a long season for both the men’s and women’s cross country teams, who may end up racing in the NCAA Division II Championships in Evansville, Indiana with a strong outing at the Regional Championships. In the latest U.S. Track & Field Cross Country Coaches Association rankings, the men’s team ranked No. 5 in the nation while the women ranked No. 20. Regionals will be held at Ash Creek Preserve in Monmouth, Oregon on Nov. 4 starting at 10 a.m.